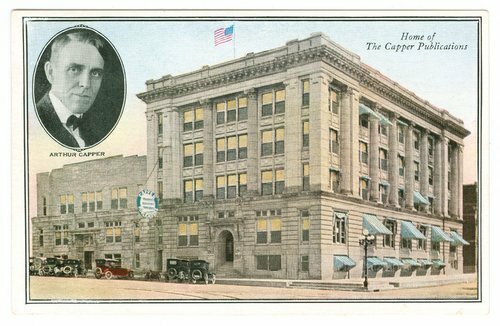 This colored postcard shows Capper Publications and its founder Arthur Capper. Located at Eighth and Jackson Streets in Topeka, Kansas, the building was made of Bedford stone, terra cotta and reinforced concrete. It housed Capper Publications which published a number of newspapers including the "Farmers Mail and Breeze" and the "Topeka Daily Capital."